← Monday Question – Perfume Aside, What Are You Passionate About? Last week’s Monday Question was a lot of fun! I pitched the charismatic leaders of two esteemed houses against one another and while the race was close, there has been a clear winner in the end. The fabulous Undina, of Undina’s Looking Glass was once more kind enough to take it upon herself to create a visual impression of the statistics. So without further ado: here is the beautiful graph showing the results of this showdown. Frédéric Malle won with a margin of four votes, but it is pretty clear we wouldn’t want to be without either one of them. Thankfully we don’t have to be. If you enjoyed this, take a look at Undina’s graphs of the results of prior showdowns, Chanel vs. Guerlain and Parfumerie Générale vs. By Kilian. 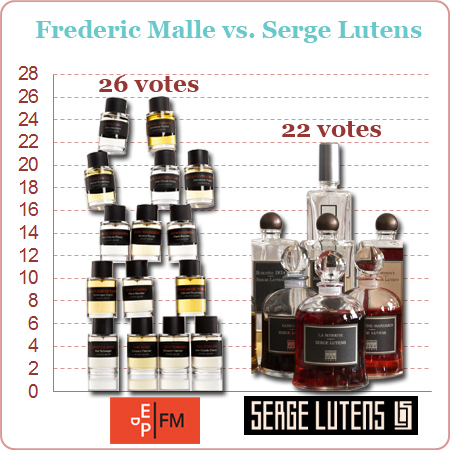 This entry was posted in Frederic Malle, Monday Question, Serge Lutens and tagged Frederic Malle, Results Monday Question, Serge Lutens. Bookmark the permalink. From a purely aesthetic point of view though, I would love to fall in love with and eventually own one of those exquisite bell jar bottles. I love this 🙂 !! Undina is so creative! Similar to Miss Woolf I have limited experience with both perfume houses but fragrant fairies are rectifying this 😀 !! Great! Have fun exploring the lines! Thanks for the results, B and thanks to Undina for such a great graphic, I love it! Interesting to see that FM didn’t totally run away with it. Undina’s graphics make this so much fun. WOW! Surprise!! I thought I’d be on the winning team for sure. “it is pretty clear we wouldn’t want to be without either one of them. Fabulous graph – and as a newcomer to the board it was fun to look t the other two. These mini-surveys are fun! Many thanks to the talented Undina for great graphic! I voted for Malle, but only by a slim margin. I would not want to give up any of my Malle or SL bottles for anything. I bet that if this poll was capable of gauging the intensity of our admiration for each perfumer, then SL would have run away with the prize. 😉 Well, at least MY intense admiration of SL would have helped him! I do love FM, though. It’s funny, I find that I would prefer to wear more of the FM fragrances but I am in awe of the SLs. Even the SLs I don’t particularly like I enjoy visiting from time to time just for the interesting ride they take me on. We often talk about whether perfume is art, in the case of Serge Lutens I think there is no doubt about it. So true! Smell is such an undervalued sense. I feel badly for the people that can’t or won’t experience the beauty, excitement, fun, sometimes horror of perfume. I appreciate so much what both men contribute to the art of olfaction. That is a fantastic graphic! Great job Undina! How cute and so creative. Undina does great things with photos doesn’t she? Well, I can’t say I’ve ever sampled even one of FM’s scents. Next time the poll comes around, I will have more experience.